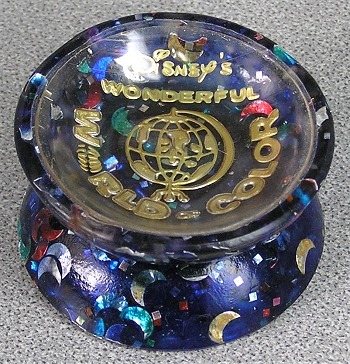 The World of Color was a very unusual item from the old Duncan company, and one of my personal favorites. The halves were poured and molded, so the mix of glitter and foil stars could be mixed into the translucent plastic. The effect was dazzling, and many colors were produced. The side logos were different on each side, and the clear plastic caps were printed in reverse on the inside to protect the logos from wear. The caps are concave inwards, giving the yo-yo a totally unique feel. The dazzle of the WOC made is a good advertising model for Disney's television show, "Disney's Wonderful World of Color". But this was a production model as well, sold directly from Duncan's catalog to all stores. The concave version, like the one pictured here, is less common than the standard model. This one also has "moons" embedded in the plastic, instead of stars, the only one I've seen like it. And it displays an older logo on the back as well. So this one is a very unusual World of Color.